Elite Event and Lemon Chicken with Asparagus. Last night man friend and I hit up yet another Yelp event. The elite Dallas team is top notch in putting on some great events. I have to say there are a lot of perks to being an elite Yelper! You can check out some of my reviews here. 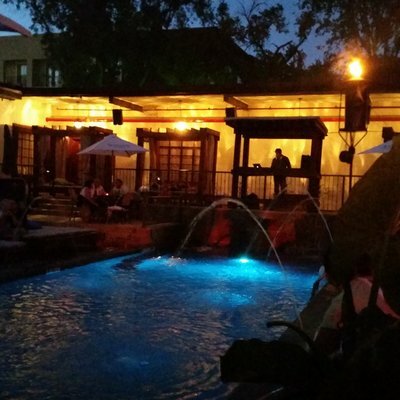 We hit up Salt, this new pool/lounge venue downtown. Once we got in we were warmly greeted, checked in and they gave me this fancy new beach towel. Fun fun. 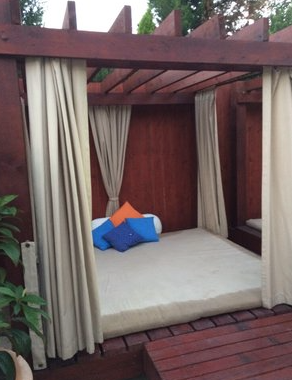 Check out the cabanas! I probably could have spent a couple of days in there. We hung out on the patio all night long and enjoyed the beautiful view. I even took some pics with some of the awesome elite crew. These folks rock. Moving on…I have a delicious, fresh and easy recipe for you to check out. Especially for those of us that don’t like to slave away in the kitchen. I have too many miles to run and too much fun to have to stand over a stove all day! So here you go. Preheat oven to 400. Marinate the chicken in fresh lemon juice, olive oil, garlic/salt/pepper. Place in oven and cook on 400 for 30 minutes. In the last 10 minutes of cooking chicken throw in asparagus (marinated with a little olive oil and garlic) and cook until roasted. You can take chicken out when it’s done and roast asparagus a little bit longer if you like ‘em crispy. And don’t forget, folks. Paper plates are always classy. Have you made any quick and healthy dinners lately? Yum, that asparagus looks amazing!!! Nice recipe and wow, what an extraordinary event!!! It looked like it was absolutely top notch!!! I love the patio view!!! Gorgeous!! Have a great day!!! That view was definitely my favorite for sure! I didn’t know you could be an elite yelper…yelpest? Is there a specific word? Lol. I don’t know…I got kind of turned off by Yelp only because as the Office Manager of my job, they keep trying to call & call & call and promote our business for us & we’ve told them no thank you many a times…so that has kind of turned me off from both sides of Yelp, ya know? However, I still do get their emails occasionally about what’s going on in SLC & I find out about some of the little restaurants that I didn’t know existed, so there is a positive to that. 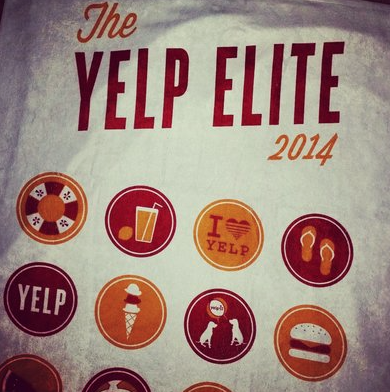 It sounds kind of fun being an elite yelper, and I’d love to, but we don’t have the time. 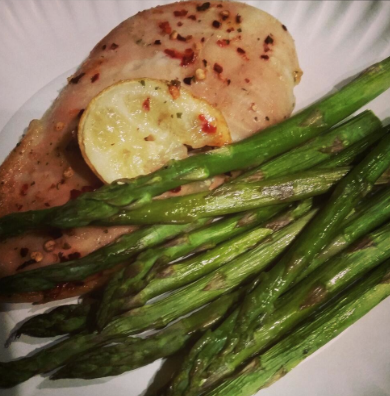 As far as meals go…I’m going to have to try this lemon chicken & asparagus for me and the boyfriend. I know his kids won’t eat it. 😦 But…for me…I’ve found lately that the crockpot is my best friend! LOVE it!!! 🙂 You are funny! 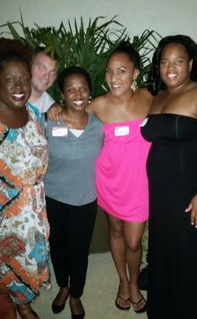 I love being an elite yelper…really all you have to do is write a lot of reviews and occasionally show your face at events! It really isn’t a lot of ‘work’ so to speak. Just sharing in fun places and trying different foods with some FUN people. event looks sweet and the recipe looks great! It was super sweet!! Great night to just kick it! And, I love simple meals like the lemon chicken! What gorgeous pictures and a fun event. Lemon chicken is one of favourite dishes. It’s deelish! Might have leftovers tonite! Okay I am an obsessive yelper!!!! How on earth does one become a YELP ELITE??? You have to be nominated! Once that happens you’re in! You should be able to get a friend to nominate you. Check the website and it should have all the rules and what not. I have been a part of it since 2011 and I love it!! Once you become Elite if you keep your review game strong/stay active on the site its fairly easy to automatically be chosen again. OOOOOOOO! We should be friends on Yelp… You can nominate me! lol! Salt looks awesome! I am putting it on my summer to-do list!